This Avalokiteśvara bodhisattva has four arms in his “Six-Syllable” Saakari manifestation, a depiction of the six syllables of his specific sacred formula (mantra): Om ma I padme bu” (Glory to the gem in the lotus flower). The repeated recitation of this mystic phrase is a way for disciples to achieve salvation. The pietist cult centered on this mantra expanded more and more over time. In his Saakari manifestation, Avalokiteśvara is considered to be the protector of Tibet. Seated in the diamond position, the bodhisattva has four arms. The two main hands are joined in front of the chest in the divine offering gesture (anjali mudra). The rear hands hold the rosary and the lotus flower (padma), his main attribute. The god reigns from his Potalaka palace on a mythical island off the south coast of India. Chinese Buddhists situate this divine residence on Putuoshan Island in the Shanghai region. Surrounded by walls, the residence also acts as a “pure land”, a paradise where the bodhisattva’s worshippers hope to be reborn for a final reincarnation before breaking free of the cycle of universal causality (sa’sara). This “paradise” of Avalokiteśvara is modeled on Sukhavati, the “pure land of Amitabha”, the Buddha of the West, who has been worshipped since the first centuries of the Christian era. 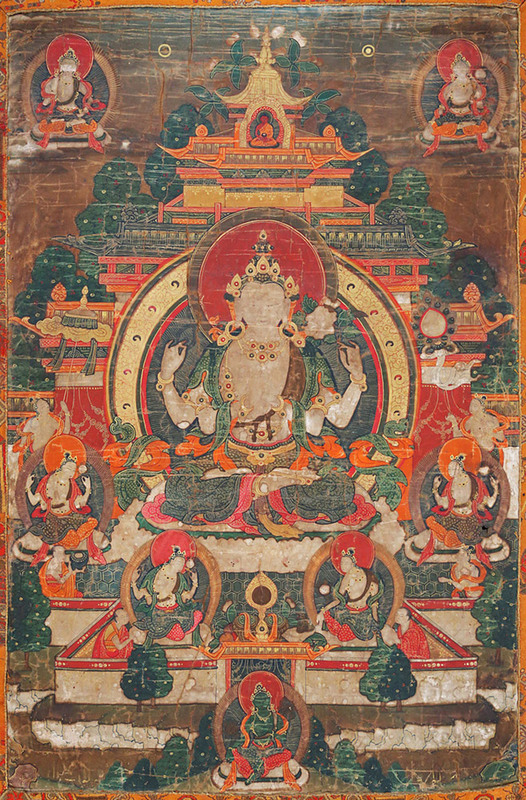 A thangka in the Rubin Museum of New York (inv. F 1997-4.1 Cf Mullin, 2007, p. 69, fig. 29) shows a pond in front of the palace, filled with lotus flowers, the transposition of the “pool of seven jewels” of the pure land of Sukhavati. In this painting, a gazebo at the top of the palace shelters Amitabha, the tathagata of which Avalokiteśvara is the hypostasis in the phenomenal world. Four secondary forms of the bodhisattva surround him, all holding the padma lotus. At the bottom of the composition, the green Tara goddess (Syamatara) guards the entrance to the divine residence. In the upper spandrels, we recognize the supreme Buddha Vajrasattva on the left, and on the right the white Tara goddess (Sitatara). The finely crafted work is part of the devotional artistic production promoted widely by the 5th Dalai Lama (1617-1681) after he conquered all of Tibet in 1642, and then, after his death, by the regent until his fall in 1705. Here the theme exalts both the dalai lamas, incarnations of Avalokiteśvara, and the independence of a unified Tibet. The residence that the 5th Dalai Lama built west of the capital Lhasa, the Potala Palace, reinforces this symbolism of a pilgrimage to the holy city, which is again made as of this period. The style is part of the new sMan-bris, an aesthetic in great favor with the Potala court at this time. Provenance: Béatrice Kiener collection, France, since the 1970s. Art Loss Register Certificate, ref. S00106957. Mullin, Glenn H. : Buddha in Paradise. A Celebration in Himalayan Art. New York, Rubin Museum of Art, 2007.